Research has shown that the natural sleep rhythms of adolescents shift up to two hours later after the start of puberty. In other words, teens naturally go to sleep later and wake up later than younger children. However, most US middle and high schools start before 8:30 a.m., exposing teens to the negative physical and mental health impact of too little sleep. In August 2014, the American Academy of Pediatrics (AAP) released a statement recommending middle and high schools start at 8:30 a.m. or later, to enable teens to have sufficient hours for sleep. Unclear is whether parents see a benefit to a later school start time, or worry about a negative impact on transportation, after-school activities and school budgets. In November/December 2014, the C.S. 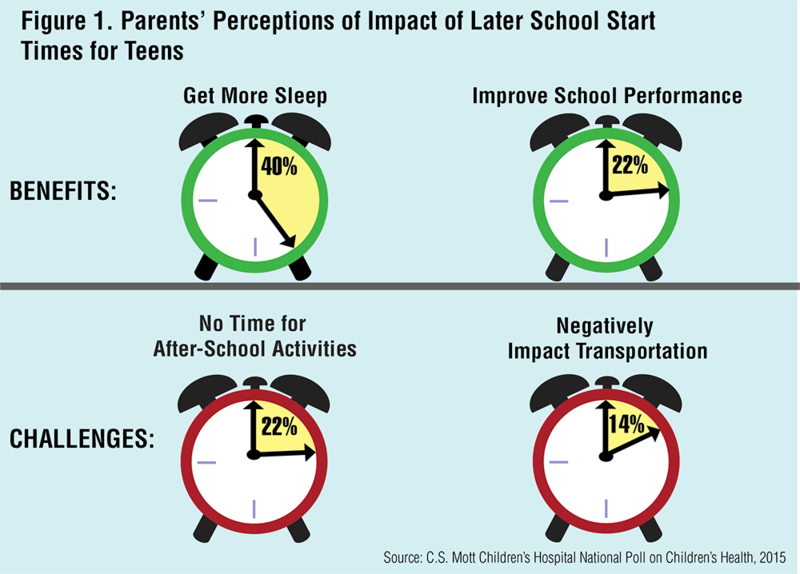 Mott Children’s Hospital National Poll on Children’s Health asked a national sample of parents of children in middle or high school (age 13-17 years) about the impact of later school start times for teens. When asked how a start time of 8:30 or later would affect their teens, two in five parents expected that a later start time would allow their teens to get more sleep (Figure 1). About one in five parents think having a delayed start time would improve their teens’ school performance. On the other hand, about one in five parents believe that later start times would not allow enough time for after-school activities, and one in seven parents say later start times will negatively affect transportation. Only 20% of parents had previously heard or read about the new AAP guidelines that recommend middle schools and high schools delay start times until 8:30 or later. However, 71% of parents agreed with the AAP guidelines once they were aware of them. The majority of parents (88%) say their teens’ schools currently have a start time before 8:30 a.m. Among these parents, 27% of parents would support a school start of 8:30 a.m. or later only if it did not impact the school budget, and 24% would support a later start time regardless of impact on the school budget. About one-half (49%) do not support a later school start time. Half of parents with teens whose schools currently start before 8:30 a.m. would support a school start time of 8:30 or later. 40% of parents believe their teens would get more sleep if school started at 8:30 a.m. or later. 22% of parents say having a start time of 8:30 a.m. or later would not allow enough time for after school activities. According to the AAP, getting the appropriate amount of sleep helps teens improve physical health (e.g., reduce the risk of obesity) and mental health (e.g., decrease depression), and also has been shown to improve safety (e.g., fewer motor vehicle accidents), academic performance, and quality of life. Having a later start time for middle and high school is one strategy to promote sufficient sleep while acknowledging teens’ natural sleep rhythms. This latest Poll brings parents’ voices the national conversation about teens’ sleep and school start times. Parents’ opinions are more mixed than the medical evidence would suggest. In fact, among the vast majority of parents whose teens currently start school before 8:30 a.m., only half would support a shift to a later start time. While a large minority of parents believe that later start times will allow their teens to sleep longer, a smaller group expects that their teens’ academics would get better as a result. On the other side of the coin, there are parents who are concerned that later school start times would leave less time for after-school activities and would interfere with transportation arrangements. These concerns, which highlight the importance of enriching experiences and logistics for families, pose challenges for school boards that are considering shifting to later start times. Parents on both sides of this issue will want to be aware of this dialogue as it arises in their teens’ school districts in the months and years ahead. This report presents findings from a nationally representative household survey conducted exclusively by GfK Custom Research, LLC (GfK), for C.S. Mott Children’s Hospital via a method used in many published studies. The survey was administered in June 2014 to a randomly selected, stratified group of adults age 18 and older from GfK’s web-enabled KnowledgePanel® that closely resembles the U.S. population. Responses from parents with a child 13-17 (n=636) were used for this report. The sample was subsequently weighted to reflect population figures from the Census Bureau. The survey completion rate was 53% among parent panel members contacted to participate. The margin of error is ± 1 to 5 percentage points and higher among subgroups. Davis MM, Kauffman AD, Singer DC, Matos-Moreno A, Clark SJ. Parents conflicted about later school start times for teens. C.S. Mott Children's Hospital National Poll on Children's Health, University of Michigan. Vol 23, Issue 1, February 2015. Available at: http://mottpoll.org/reports-surveys/parents-conflicted-about-later-school-start-times-teens.